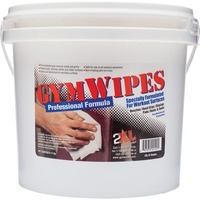 GymWipes Professional Towelettes in a convenient bucket are specially formulated for workout surfaces and kill 99.9 percent of bacteria in 15 seconds. Proven, reliable, nonalcohol based formula dries fast and easily cleans all kinds of surfaces. It is safe on vinyl, leather, chrome, foam grips, rubber, painted surfaces, metal and even electronic displays. It also neutralizes odors that build up on surfaces. Disinfectant, hygienic, sanitizing wipes are alcohol free, bleach free and phenol free. High sheet count in convenient, refillable bucket means fewer refills.